When it comes to tricky installs, retrofitting old buildings with unobtrusive audiovisual systems can be about as tough as it gets. Especially when the room in question has 20-plusfoot-high ceilings, tons of reverberation, distinct aesthetics (and a picky architect) around which to design. Such was the case of Alumni Hall at Thomas Jefferson University in Philadelphia, which integrator Advanced AV of nearby West Chester, PA was tasked with converting from a medical museum into a high-tech space that could host a variety of events, including dinners with entertainment. “It was basically an off-the-beaten-path mini museum that housed replicas of old operational instruments dating back to the 1800s,” said Rich Diperstein, account executive at Advanced AV. At the end of 2014, the company began work adding audio, video, networking, and control to the space. Since it wasn’t a very frequently used room, there were no logistics issues commonly associated with retrofit operations, which often require careful planning around occupancy schedules. Diperstein and his team knew the space called for a solution based on active powered line arrays, and decided on a pair of Renkus-Heinz IC8-R-II digitally steerable arrays. “Renkus was our go-to manufacturer for this specific application because it was an active-powered device, as opposed to a passive device that would be more of aiming the speaker and hoping for the best; this could be obviously tailored electronically,” Diperstein said. Originally intended to be flush-mounted to the wall, Advanced AV had to devise a custom covering solution to conceal the mounting hardware of the Renkus-Heinz line arrays. However, after engineering the entire system setup, the Advanced AV team was thrown a curveball: The architect didn’t want the speakers to be mounted flat to the wall, as planned, to preserve the wall’s aesthetic quality. After considerable back and forth between the firms—according to Diperstein, it was one of the most time-consuming parts of the entire project—Advanced AV came up with a solution, mounting the speakers to the sides of an alcove cut into the front wall. Nevertheless, the steerable nature of the line arrays allowed for the sound to be tailored to the space, even though the location was changed. In addition to the arrays, the system also employs a pair of JBL Control 40CS/T in-ceiling subwoofers for fill, powered by a Crown DriveCore 2 Series amp. The entire system is run through a BSS Soundweb London BLU-100 DSP. 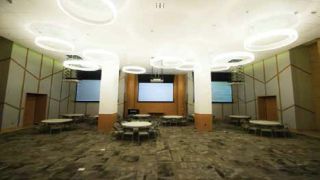 Besides intelligible audio, the Advanced AV team was also tasked with implementing a video projection system—utilizing three Christie WX951-Q projectors with accompanying 150-inch Da-Lite screens at the front of the room—that also turned out to be far from straightforward. All told, the entire project took some 10 months to complete, and wrapped up in October of 2015. Since then, the reception has been great, according to Diperstein. The previously underutilized space now hosts a number of presentations and other events. And despite the room’s difficult acoustics, Advanced AV’s design made for a great listening environment. “They love the space now; the sound is amazing,” Diperstein said.